MORE International Keynote Speakers for Celebration! 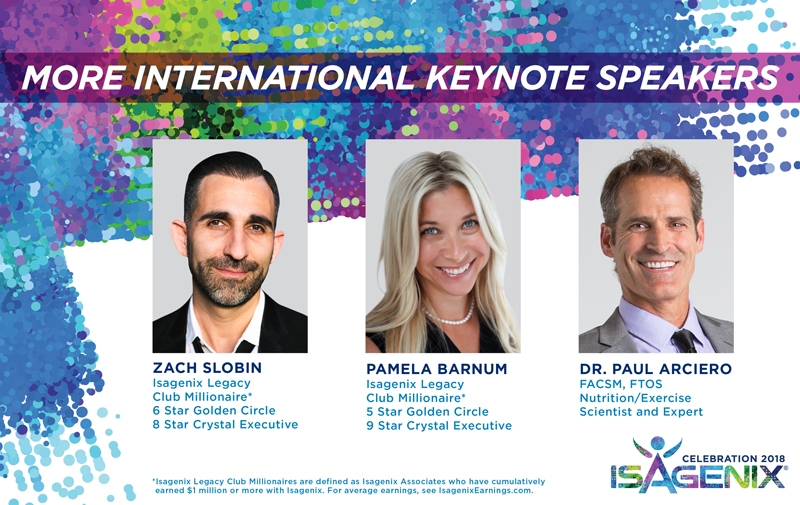 In December, we announced that the incredible Isagenix Legacy Club Millionaire*, 11 Star Platinum, 19 Star Crystal Executive, Laura Stevens would be joining us for Celebration. If that got you fired up, you’re going to love this next announcement. We’ve lined up another THREE International Keynote Speakers to grace the stage this Celebration. Want to know who they are? Traveling all the way from the US and Canada, we’re pleased to bring you none other than Nutrition/Exercise Scientist and Expert, Dr. Paul Arciero, Isagenix Legacy Club Millionaire, 6 Star Golden Circle, 8 Star Crystal Executive, Zach Slobin and Isagenix Legacy Club Millionaire, 5 Star Golden Circle, 9 Star Crystal Executive, Pamela Barnum. Our special guest speakers will take the stage to share everything you need to know about Isagenix® products and how to build a successful business. You don’t want to miss this! Like a true entrepreneur, Zach grew up with the mindset of, “I don’t know what my career will be. I just know I want to do a lot of things at once.” He explored several career paths, struggled a ton, failed a lot, succeeded just to lose it all but with continued effort Zach found his calling. This proud START Ambassador has built a successful Isagenix business alongside his beautiful wife, Eden, and spends his days coaching others to do the same. Drawing on over 10 years of experience in network marketing and over 20 years of experience in sales psychology, training, coaching and personal growth, Zach joins our Celebration trainer lineup ready to share his playbook with attendees. A former Undercover Police Officer and Federal Crown Prosecutor, Pamela and her husband, Kevin worked 60+ hour weeks in their high-pressure jobs, leaving them little time to spend together with their 13-year-old son, Kaleb. Eager to live life differently and earn time flexibility, they began building their Isagenix business in 2009. Thanks to their passion and hard work, the couple built their Isagenix business in the pockets of their time, achieving an incredible multiple six-figure income in less than 18 months. Resigning from their full-time positions to pursue a career in network marketing, these Isagenix Legacy Club Millionaires are now able to spend more time together as a family and even moved to the Canadian Rocky Mountains to allow Kaleb the opportunity to pursue his passion for ski racing. Along with being a full-time network marketer, Pamela is also a published author and celebrated public speaker. Dr. Paul is a leading expert in nutrition and fitness and, for the past several years, he was an independent, third-party scientific researcher who conducted several human trial intervention studies using the Isagenix Weight Loss and Performance solutions. Dr. Paul is a member of the Isagenix Scientific Advisory Board and joins our team of International Keynote Speakers at Celebration to share his knowledge on the benefits of nutrition and fitness for optimal health and performance and the impact of Isagenix products. Whether you want to learn how to take your business to the next level or simply eager to learn more about the Isagenix products, our Keynote Speakers have you covered. Tickets are going fast so head to ANZ.IsagenixEvents.com to get your hands on them before they’re gone!